Rising challenges for European carriers are likely to mean more dealmaking this year. The turbulence in Europe’s airline industry is likely to culminate in a massive shakeout for the aviation sector in 2018. Recent failures such as that of British low-cost airline Monarch, Germany’s Air Berlin and Italy’s Alitalia have created conditions ripe for a new wave of merger-and-acquisition activity in the sector. While Brexit undoubtedly hastened the demise of loss-making Monarch, the British pound's post-referendum nosedive against both the dollar and the euro proved to be a body blow for the airline, already struggling to reduce jet-fuel and debt costs. It also put a $3 billion order to acquire Boeing 737 Max aircraft beyond the airline’s reach. For now, the European airline sector remains deeply fragmented. Four airlines—Ryanair, Lufthansa, Air France-KLM and IAG—control 40% of the market in Europe. Compare that with the US, where the 'Big Four'—Southwest, Delta, United and American Airlines—control 80% of the market. The fragmented European market means more competition and pressure on airlines' pricing power at a time when low-cost carriers (LCCs) are trying to grow their long-haul business to Asia and North America from Europe. LCCs are expected to gain a 25% share of transatlantic travel by 2026. Add to the mix challenges like fleet financing, infrastructure deficits and high debt costs, and the stage is set for a wave of mergers and acquisitions. It doesn't help that Middle East–and Asia-based carriers such as Qatar Airways and Etihad add to the pressure for lower fares, have deep pockets, and are looking for M&A deals in Europe. Qatar currently owns a 15% stake in International Airlines Group (IAG) while Etihad has bought shares in Air Berlin and Alitalia. Ryanair CEO Michael O’Leary predicts that Europe will be left with just five major airline groups by 2022: Ryanair, Lufthansa, Air France-KLM, IAG and EasyJet. Air France and Lufthansa have been the most acquisitive of Europe’s full-service carriers (FSCs) since 2003. Air France merged with KLM Royal Dutch in 2004. 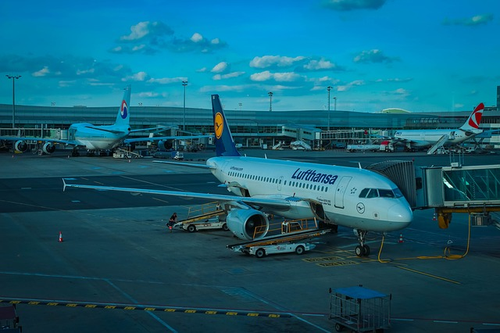 In response to its rival’s move, Lufthansa embarked on a prolonged takeover spree that included acquiring majority equity stakes in Austrian Airlines, Swiss International Air Lines and Brussels Airlines. Now, Lufthansa is eyeing a possible takeover of Alitalia and Scandinavian Airlines (SAS) with the aim of becoming not only Europe’s leading carrier, but also a major global player. The Germany-based airline has already agreed to purchase core parts of the loss-making Air Berlin, including its low-fare subsidiaries Niki and LG Walter, for $244 million (€210 million). The deal is expected to close in January 2018. Lufthansa continues to look for other acquisitions and has emerged as one of the two credible suitors for Alitalia. EasyJet is the Italian airline’s other suitor. Alitalia started a bankruptcy process in May last year. While Lufthansa, EasyJet and Ryanair are showing most aggression in the pursuit of acquisitions, an M&A push by airlines like Air France and the cash-flush Norwegian Air Shuttle shouldn't be discounted, says Eric Thissen, a Brussels-based aviation analyst. "Air France will certainly play a role in the future shake-up of the industry in Europe,” Thissen says. “Norwegian, which is looking to expand its long-haul to North America and Asia, will also look for targets." Competition, says Thissen, may curb Lufthansa’s appetite for acquisitions, however. By contrast, Ryanair’s "lack of history and craft" in negotiating M&A deals could play into the hands of its more traditional airline rivals in Europe. "Ryanair’s often-confrontational corporate culture under CEO Michael O’Leary’s leadership will precede it into negotiations,” Thissen says. “At some time or another, O’Leary has slighted airline unions, government officials, EU ministers and rival airline CEOs." O’Leary’s colorful description of pilots as "glorified taxi drivers" is certain to hurt rather than advance the company’s growth ambitions, particularly at a time when the budget airline is losing pilots and cabin crew to rivals such as EasyJet and Norwegian. This "lack of history and craft" was evident in Ryanair’s serial, but ultimately failed, bids to acquire Irish flag carrier Aer Lingus. IAG floated a successful offer for $1.17 billion (€1 billion) to acquire Aer Lingus in 2015. The full force of consolidation being unleashed in Europe’s airline sector could be limited by national interests and branding challenges. National airlines such as Romania’s Tarom and Poland’s LOT Polish Airlines may be attractive to suitors, but are overly complicated to acquire. For many midsize European airlines such as Finnair, LOT and SAS, achieving long-term sustainability is likely to involve reorganizing and joining global alliances, rather than selling to a larger foreign entity. Complex antitrust rules in Europe can make alliances a much more attractive option, as they could offer carriers market access without the competitive, cost and legal hurdles of acquiring a rival airline.